Bánh chưng is a traditional Vietnamese rice cake which is made from glutinous rice, mung beans, pork and other ingredients. Its origin is told by the legend of Lang Liêu, a prince of the last king of the Sixth Hùng Dynasty, who became the successor thanks to his creation of bánh chưng and bánh giầy, which symbolized, respectively, the Earth and the Sky. 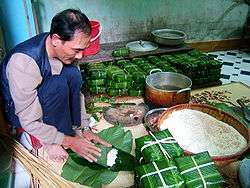 Considered an essential element of the family altar on the occasion of tết, the making and eating of bánh chưng during this time is a well-preserved tradition of Vietnamese people. Beside the tết holiday, bánh chưng is also eaten all year round as a delicacy of Vietnamese cuisine and one of the national dishes of Vietnam, in addition to chả giò and phở. According to the book Lĩnh Nam chích quái (Extraordinary stories of Lĩnh Nam) published in 1695, the creation of bánh chưng was credited to Lang Liêu, a prince of the last Hùng kings of the sixth dynasty (c. 1712 - 1632 BC). It was said that in choosing a successor among his sons, the monarch decided to carry out a competition in which each prince brought a delicacy representing the sincerity for the ancestors on the occasion of the tết, whoever could introduce the most delicious dish for the altar would become the next ruler of the country. While other princes tried to find the rare and delicious foods from forest and sea, the eighteenth prince, Lang Liêu, who was the poorest son of the Hùng king, could not afford such luxurious dishes and had to be content with everyday ingredients, such as rice and pork. Finally, he created one cake in the square form of earth called bánh chưng and one in the round form of sky called bánh giầy from these simple ingredients. In tasting the dishes offered by his son, the Hùng king found bánh chưng and bánh giầy not only delicious but also a fine representation of the respect for ancestors. 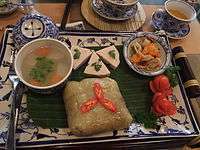 Therefore, he decided to cede the throne to Lang Liêu and bánh chưng, bánh giầy became traditional foods during the tết. Lang Liêu founded the Seventh Hùng dynasty (c. 1631 - 1432 BC). The required ingredients of bánh chưng are glutinous rice, mung bean, fatty pork and black pepper, salt, sometimes green onion, and nước mắm for spices. 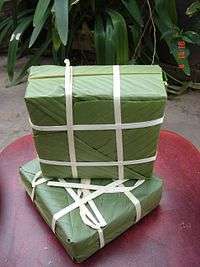 In the wrapping stage, one needs lá dong, strings split from giang, one type of bamboo which has long node, and sometimes a square mold in wood so that bánh chưng can be wrapped in a better shape, lá dong, which is popular only in the Southern Asia, can be substituted by banana leaves or even lá bàng. 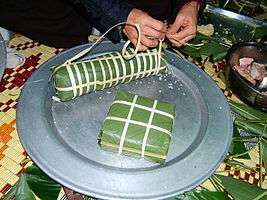 Lá dong and giang strings have to be washed carefully in order to preserve the taste of the cake, giang strings may be soaked in salt water or steamed so that they can become flexible enough for wrapping. People often choose high quality rice and bean for making bánh chưng, they are soaked in water for 2 hours in case of mung bean and 12 to 14 hours in case of glutinous rice. The fat and lean pork is preferred for bánh chưng because its fatty flavour well associates with the glutinous rice and mung bean. After being sliced in big parts, pork is mixed with pepper, onion and salt or nước mắm. People in Bắc Ninh once added sugar in this mixture of spices. Nowadays, the tradition of self-made bánh chưng gradually declines in Vietnam when the size of a typical family is smaller and people do not have enough time for the preparation and making of bánh chưng, instead they go to the bánh chưng shop or order cakes in advance from families which specialize in making them. Therefore, bánh chưng still appears in each family during the Tết but they are not a family product any more. With the shift of bánh chưng making from family to specialized manufacturers, some craft villages became famous for their reputation in making bánh chưng such as Tranh Khúc village or Duyên Hà village both in Thanh Trì, Hanoi. Each year, on the occasion of the Death anniversary of the Hung Kings, a competition of making bánh chưng and bánh dày is often organized in Hùng Temple, Phú Thọ. Participants from eight different regions including Lào Cai, Hanoi and Cần Thơ are provided with 5 kg of glutinous rice, bean, 1 kg of pork so that they can make 10 bánh chưng in 10 minutes, the product of the winning team will be present in the official altar of the festival. In 2005, bánh chưng makers in Ho Chi Minh City offered Hùng Temple a pair of giant bánh chưng and bánh giầy, the size of the bánh chưng was 1.8m x 1.8m x 0.7m and 2 tonnes in weight after cooking, it was made in Ho Chi Minh City and subsequently transferred to Phú Thọ. Wikimedia Commons has media related to Bánh chưng. ↑ Aruna Thaker, Arlene Barton Multicultural Handbook of Food, Nutrition and Dietetics 2012 Page 171 "Bánh chưng"
1 2 3 Monica Janowski; Fiona Kerlogue (2007). Kinship and food in South East Asia. NIAS Press. pp. 251–257. ISBN 87-91114-93-4. ↑ Alice M. Terada; Janet Larsen (1993). Under the Starfruit Tree: Folktales from Vietnam. University of Hawaii Press. pp. 105–108. ISBN 978-0-8248-1553-0. ↑ Spagnoli, Cathy (1998). Asian Tales and Tellers. August House. pp. 66–67. ISBN 0-87483-527-5. ↑ Agar, Charles (2006). Frommer's Vietnam. John Wiley and Sons. p. 22. ISBN 0-7645-9676-4. 1 2 3 4 5 Laurel Kendall; Nguyễn Văn Huy (2003). Vietnam: journeys of body, mind, and spirit. University of California Press. pp. 75–77. ISBN 0-520-23872-9. 1 2 Chi Nguyen; Judy Monroe (2002). Cooking the Vietnamese Way. Twenty-First Century Books. pp. 66–67. ISBN 0-8225-4125-4. ↑ Ngô Chí Tùng (2008-02-04). "Tết ở Trường Sa" (in Vietnamese). Laodong.com.vn. Archived from the original on 2009-12-08. ↑ Nguyễn Nhã (2006-01-25). "Bánh chưng ngày Tết". Tuoitre.com.vn. Archived from the original on 2010-01-31. 1 2 Caitlin Worsham (2008-02-10). "Banh chung: leafy chunks of love and lore". Vietnamnet.vn. Archived from the original on 2009-07-18. ↑ Pam Mailand; Robert Lewis (1997). Vietnam, young people, old country: primary. Curriculum Corporation. p. 21. ISBN 1-86366-381-9. ↑ Jeffrey M. Farber; Ewen Cameron David Todd (2000). Safe handling of foods. CRC Press. p. 387. ISBN 0-8247-0331-6. ↑ "Craft village's banh chung gets trademark". Vietnamnet.vn. 2008-02-06. Archived from the original on 2009-11-09. ↑ Minh Nguyen (2004-01-22). "The cake of mystique". Vietnamnet.vn. Archived from the original on 2010-04-14. ↑ "Festival to honour nation's ancestors". Vietnamnet.vn. 2009-04-03. Archived from the original on 2009-04-14. ↑ Van Tien (2005-04-13). "Biggest cakes for Hung Kings". Vietnamnet.vn. Archived from the original on 2008-03-16. 1 2 Andrea Quynhgiao Nguyen; Bruce Cost; Leigh Beisch (2006). Into the Vietnamese kitchen: treasured foodways, modern flavors. Ten Speed Press. p. 259. ISBN 1-58008-665-9. ↑ Vũ Bằng. "Tháng Hai, tương tư hoa đào". Thương nhớ mười hai (in Vietnamese). Literature Publishing House. ↑ "Hội thảo Tết Việt 2005: Tôn vinh VH dân gian" (in Vietnamese). Vietnamnet.vn. 2005-01-31. Archived from the original on 2009-05-12. ↑ Kong Foong Ling (2002). The Food of Asia. Tuttle Publishing. p. 172. ISBN 0-7946-0146-4. ↑ Trần Thanh Hà (2006-03-10). "Xôi đen, bánh chưng "gù" của người Sán Dìu" (in Vietnamese). Vinhphuc.gov.vn. Archived from the original on 2010-04-22. ↑ Quang Anh (2005-02-07). "Bánh chưng mặn, bánh chưng chay và những chiếc ô tô" (in Vietnamese). Vietnamnet.vn. Archived from the original on 2010-10-22.